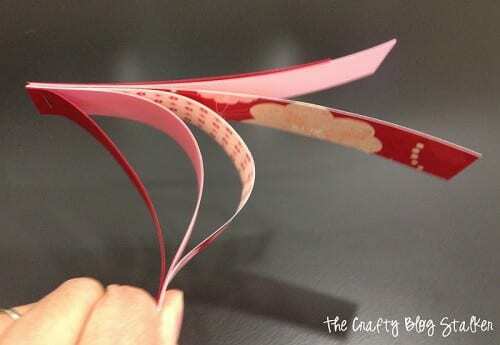 Paper Strip Hearts are super easy and fun to make. Hang them from the ceiling or add to a banner for fun party decor or home decor. Easy DIY Craft Tutorial Idea. I love hearts! And there is no better way to decorate for Valentine’s Day than with hearts! 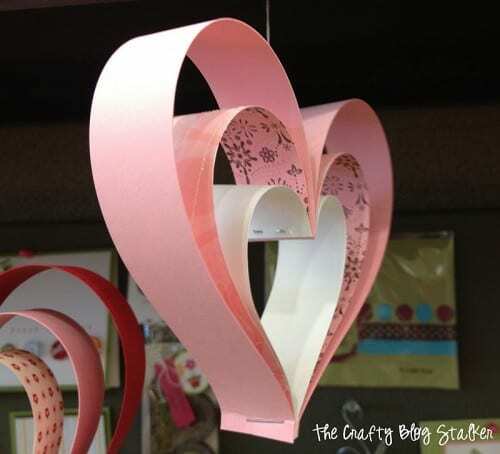 These paper hearts are super easy to make with scraps of paper and would be a great craft to make with kids. To begin, chose your paper. I chose double sided paper that also has touches of glitter in it. There are so many fun papers out there to choose from. 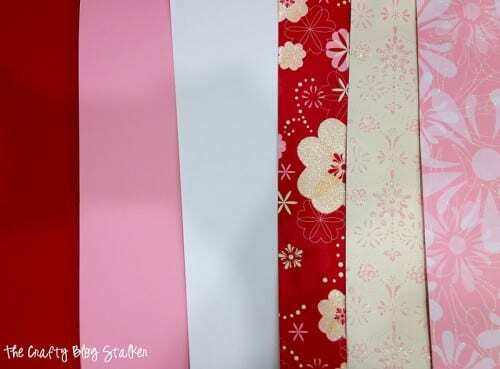 Using a paper trimmer, cut the pattern paper into strips. For each heart, you will need 6 strips. The 2 small reds are 5 inches long, the pink is 6 1/2 inches long and the patterned red is 8 inches long. To make different sized hearts, for fatter or skinnier hearts, you cut the strips into different lengths. Stack them as shown above and bring the bottoms of all the slips of paper together and staple. 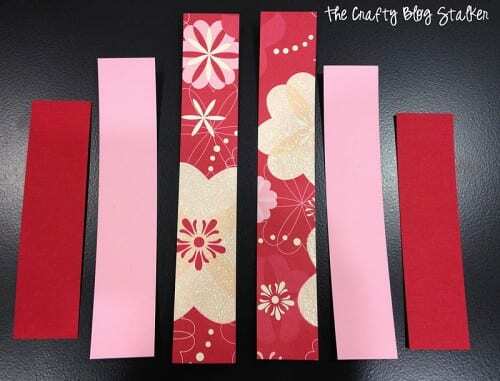 Take 3 strips of paper and bring the ends together until they are even, do the same with other three strips pulling them in the opposite direction. Then bring all 6 ends together, keeping them even, and staple the ends together. And there is your heart! Hang them with string or ribbon. To attach the string, I took a glue dot and put it down the center of the heart, put the end of the string in the center and pinch the heart together. The glue dot will hold the string, it won’t be super strong, but will hold the heart to hang it. I like to watch the hearts as they hang because they slowly spin so they are always moving. I hung some at my desk at work. Where will you hang yours? Share and leave a comment below. 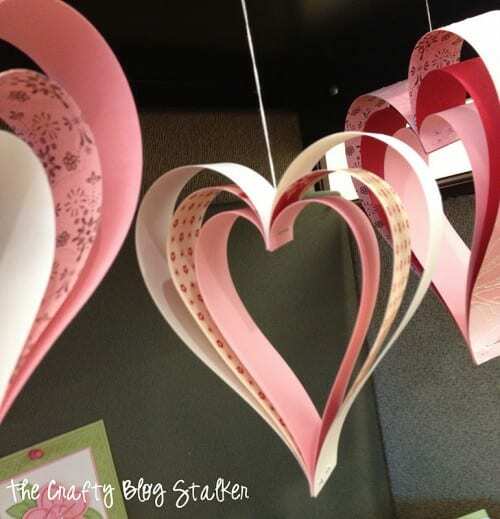 SAVE HOW TO MAKE PAPER STRIP HEARTS TO YOUR FAVORITE DIY PINTEREST BOARD! Oh how cute are these?! Thank you so much for sharing, I can’t wait to try these with my girls next week!! these are too cute!! I am your newest fan! visiting from craftomanic blog link! I know what I will be making this week with my daughter! Thanks for the great idea. Please come share at my party! I LOVE the paper choices!! Awesome job! These are wonderful and look so professional and so simple. I think we will make these at playgroup for valentines. Cheers. Those are adorable! I will definitely be making these :)Thanks for sharing! I love where you hung them – great job!! They turned out fabulously! Love the paper you used! I love these. Just found a fun craft to do this weekend! Thanks! These are really sweet. I was actually checking them out while I was searching another party, lol. Really cute. Thanks for sharing them at our Link It Up Thursday party. They are lovely and easy to do, I just tried one and they look adorable, and I just used plain white paper..for trial, and they are cute. These are cute! Gonna try making some. So lovely!! I might have to give these a try, thanks for sharing the tutorial and for linking up to our Valentines Countdown Party! These are sooo sweet! Love how cute they look hanging from the chandelier! Thanks so much for sharing with the Pink Hippo party.. can’t wait to see what you share next! These are fantastic and so easy! Thanks so much for linking this up at Doggone Dirty Craftin last week. Can’t wait to see what you have for this thursday! Hey! Thanks for linking up to my Countdown to Valentines party, I’ve featured these today as one of my favorites! Thanks so much for sharing at Mix it up Monday 🙂 I hope you’ll stop back often! This art work is really simple but very creative. This is good decoration for a valentine party at home. You have explained it very clearly. Thanks for sharing your talent with others. So pretty! I love these!! Cool, I shared on Google +. These are beautiful. I listed them in “best of the web” in Valentine’s crafts. I hope that is OK. I love the look of your hearts and used your image on my Facebook Page (Hang-Mate Products). We invented a retracting ceiling hanger that’s keeping teachers and librarians safe when they hang all of these delightful ideas of yours. Thanks for a lovely blog!